Canada has struck a blow to its monetary system that the United States has also considered many times: The Death of the Penny. Another blow has been struck against countries holding on to their physical currency. 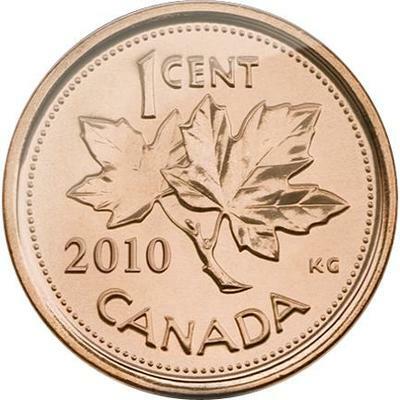 Canada announced this week that it would cease minting and distributing its penny this fall. Speaking to reporters at the announcement, Finance Minister Jim Flaherty, "The penny is a currency without any currency in Canada, and it costs us 1.5 cents to produce a penny." Apparently this move will save the country $11 million per year in costs. This news follows closely on the footsteps that Sweden is moving more and more towards a cashless society. While there is no news that Canada will take any more steps to eliminate physical currency, eliminating the penny is certainly an interesting move. For people paying by credit cards or checks, there will be no impact on the prices paid in stores. For those wishing to pay in cash, you will need to round up to the nearest five cents from here on out. So if your total comes to $5.01, you'll be paying $5.05. What do you think about the elimination of the penny in Canada? Should other countries follow suit?